Movieland Wax Museum, Buena Park, Calif.
William S. Hart, Tom Mix and Ken Maynard, cast in wax at the Movieland Wax Museum in Buena Park, Calif., in 1962. "SceniKrome" color postcard published and distributed by Golden West, 2583 Main Ave., Long Beach 6, California USA. Photograph by George E. Watson. 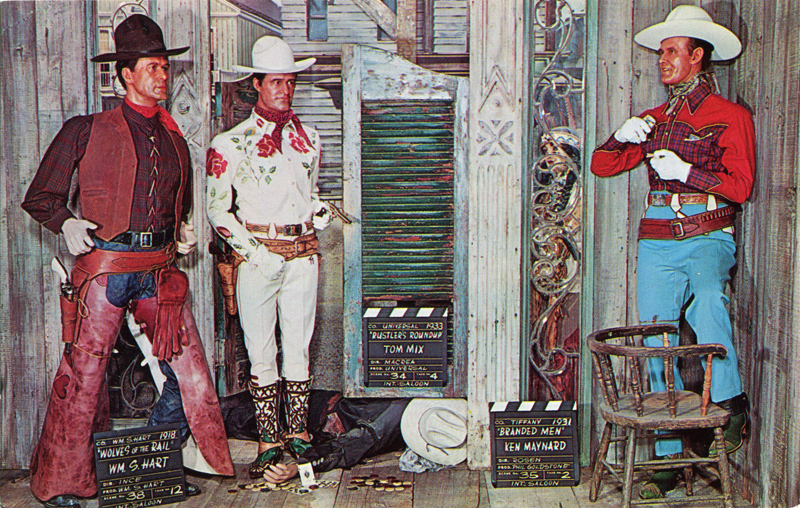 In olden movie days, several exclusive "cowboy" stars made scores of pictures each season. Displaying great personal prowess with gun and lariat, they were supported by intelligent, heroic horses. Here are three of the better known stars. All three were firmly rooted in the Santa Clarita Valley. Hart filmed in the area until 1925 and lived in Newhall from 1927 until his death in 1946. Mix used the Newhall area in the late 1910s and early 1920s and left behind two cottages on Spruce Street (now Main Street) as well as four small dressing rooms that were converted to 1+1 apartments on Walnut Street. Maynard was regularly featured in films shot at Trem Carr and Ernie Hickson's Monogram movie ranch in Placerita Canyon (later Melody Ranch). Hart's favorite horse was his pinto pony, Fritz. Mix's horse, of course, was Tony. Similarly, Maynard's horse, Tarzan, often got co-star billing. LW2466a: 19200 dpi jpeg from original postcard.